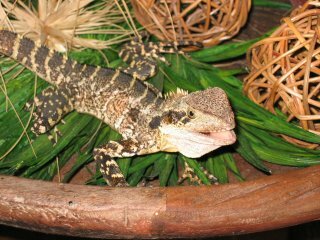 On this page we will keep you informed about animals that you have brought in to care with WIRES Northern Rivers branch. If you would like to know about a particular animal, please email us, and we will do what we can to keep you up to date. Thank you to Country Energy. On Wed 16th 2 chicks were blown out of their nest at 31 Uralba St were I work, they were in the garden when I arrived at work. I made a nest out of a small foam esky and tied it in the tree, one of the birds went missing within the 5 minutes it took to get back to them. I put one in the make shift nest and kept looking for the missing one. I phoned the Uralba St Vet to see if someone had dropped it in and asked them to phone me if it turned up and I would come and get it. I phoned our roster and spoke to Kristin who said they had rece ived the chick, which was in care with Rachel. I spoke with Rachel and made arrangements with her to bring the chick back and put it with the other one. On the way through North Lismore this morning Country Energy were doing some work with the cherry picker so I stopped and asked them if they could help put the chicks higher up in the tree. Jason and Warrick arrived about 10.30 with the cherry picker and put a new plastic makeshift nest up in the tree. He said he had rescued a baby bat a few days before hand and the lady was going to name it after his wife. Mum, dad and babies are all very happy to be together again and mum is busy feeding a couple of demanding chicks. Christina and John were on th eir way home, when they came across a dead Wallaby on the road. They stopped to check the pouch, and discovered a small joey firmly attached to the teat in Mum's pouch. They called WIRES and consequently the joey was brought i n to care. The joey is a Swamp wallaby, very young, eyes still closed, but it did not have time to go cold in Mums pouch, so it does have a good chance at life, thanks to Christina and John. To read more about Christina's time in care, please click here. Last Saturday, a farmer from Spring Grove found a newly hatched wood duckling which he suspects was blown out of a nest in a eucalypt. It was very windy. The duckling was running up to his cows, presumably looking for its mother. The farmer found another duckling which had been trampled by a cow, so he picked up the surviving one, put it in his pocket and took it to Uralba St vet. Mel collected it from the vet, gave it to me and then I had to find a mate for it. I got an 8 day old domestic duckling (muscovy/appleyard cross) and they're good company for each other. If all goes well, in about 6 weeks, the wood duck will be released in the dam on the property it came from and the domestic duck will go back to the duck breeder from whom I bought it. WIRES carer Rhianna came home with more than her daily newspaper Sunday morning, she also brought home this juvenile Goanna. Children had tried to raise it after it hatched from an egg, unfortunately if you do not know what to feed these animals also know how to house them correctly, it can be a very sad ending. Luckily this little one came in to care in time,and we hope it will recover from a shaky start to life. WIRES recieved a call from Sally that she had found a small possum dead on her lawn, it had 2 tiny babies, one still alive. WIRES carer Lisa received the dead mother and babies, and on examining the pouch she realised both babies were in fact alive, one still firmly attached to the teat. It turned out to be a Squirrel Glider, now listed as a vulnerably species. How mum was injured and died we do not know, but she was cold and so were both joey's, so Lisa quickly had them on heat till Lee, our small marsupial intensive care specialist arrived. Lee took the 2 joey's home and the weight for these little critters were a mere 12 gram each, they had a show of colour which means the fur is starting to grow.The little female had bruising to her stomach, the male seemed fine. Only time will tell if these 2 tiny joey's will survive, they have had a rough start to life, but thanks to Sally who reacted fast and called for help and Lisa that kept them warm, they certainly have a good chance in Lee's care. The tiny Squirrel gliders seen here the day after coming in to care just 56 days old. Unfortunately the gliders did not survive, extensive bruising showed up the day after they were rescued, internal injuries were too extensive. WIRES receive many calls from the public asking for information on how to care for a native animal they have found and would like to keep to educate their children. We can all understand this, and indeed why is this not allowable? Native animals require very specific foods, they also require certain conditions to thrive whilst in care. Unlike puppies and kittens they do not take to a normal house hold situation, they will in fact stress to a point of no return. Food is also a problem, as they do not eat our normal foods that a kitten may thrive on, native animals will die a slow painful death if not given the correct food and housing , specially if being found whilst young, as is mainly the case. This little Mountain Brushtail possum is a good example of what happens if not handled and fed correctly. A very sad case, WIRES recieved this animal too late, the family that had found it, did not realise the implications and unfortunately called too late. Possum was humanely euthanased, as even with veterinary treatment it was not able to survive long term. When WIRES recieved this little possum it was a mere 150 gram when in fact it should have been around 400 gram, it had been fed cows milk, and not kept under the right conditions. Native animals will not show their stress openly, to the untrained eye the animal will look fine, not untill the stress in visible would you realise what has taken place, and unfortunately at that stage it is in many cases too late. Please if finding a young native animal, call immediately let the animal be brought in to care, we will keep you up to date as to it's progress. WIRES Northern Rivers recieved an anonymous call late in the afternoon on Monday 11th April, a large number of small birds were stuck on railings at a car park in Byron Bay. Wires rescuer Tristan rushed to the scene to find well over 70 Welcome Swallows lying on the ground, and many still stuck in a sticky substance painted on the rails. Tristan called other WIRES members for help and the birds were taken to Byron Bay Veterinary Clinic. It was later discovered the sticky substance was in fact a product called "Scarecrow", sold as a deterrent for birds. Please click here for the story of the disaster at Byron Bay involving a complete flock of Welcome Swallows. 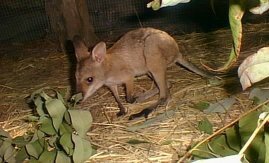 WIRES recieved a call from a member of the public, they had picked up a young Red neck wallaby joey 2 weeks prior to calling, the joey was in trouble could we please help. This little wallaby joey was in big trouble, and I am extremely thankful for the call for help, it was just in time. When finding a native animal, please call a registered animal care group as soon as possible, these animals do require specialised care, feed, and housing. It can be tempting to keep an animal such as this, the children would certainly have been very excited by the prospect of having a kangaroo as a pet, but not only is it illegal, it will usually end in disaster. This little female Red Neck Wallaby is now doing well, she was rehydrated as soon as she was brought in to care, she was fed small amounts of food as her stomach was not able to take the required amount for some time. Her weight is slowly gaining, as she gains trust and confidence. It has been a long road for this little wallaby, but she is finally starting to take an interest in life, trust has been gained, and she is starting to interact with the other wallabies in care, now outside in a nursery pen both day and night she still spends her time in her pouch, only coming out after her bottle, but she is hopping well considering she was unable to stand when first coming in to care. WIRES NR recieved a call for help with a small colony of Microbats, dumped on a carers door step. Click here for this amazing story and images courtesy of WIRES carer Rhianna. John went searching for what was making a funny sound just outside his house. What he found was this tiny 77 gram Mountain Brushtail possum, calling loudly for her Mum. Her eyes are not yet open, and it will be some time before her fur appears. John called WIRES and she is now in care with Lee. A Mountain Brushtail possum this size is intensive care, she is fed every 3 hours and kept in a humidicrib, it is in reality just like a premature baby. She will be in care for about 12 months as long as all goes well. Thank you John for calling WIRES we will keep you updated as to her progress. Leena as she was named thrived in Lee's care and has now been transferred to WIRES carer Sharon with facilities needed for her further development whilst in care. Another Mountain Brushtail is in care with Sharon, and time will tell if the two possums will become friends. Leena seen here 2 months after coming in to care. WIRES recieved a call late one evening a small joey was in need of care . His mother had been killed by a dog, the joey seemed unharmed. It turned out to be a Red leg Pademelon, now listed as a vulnerable species due to habitat destruction and dog and fox predation. The little orphan is so far doing well, it will however be some time before the joey settles down. I have found that when ever there is a situation such as this, where domestic dogs are involved, and foxes for that matter, the time involved for the joey to settle is much longer than a car accident for instance. I imagine it is due to the stress involved, transferred from the mother to the orphan. on a trailer, and drove home. Luckily Joe unloaded the tree when she got home and had a good look at her purchase, only to notice she had not only brought home the tree, in the trees branches were a tiny birds nest, with 3 pink featherless chicks inside. Joe called WIRES and the Silver eye chicks were brought in to care. First image is at 4 days old. Small birds grow fast, predators are many, so the faster they grow ,the sooner they can leave the nest. Second image is at 9 days old. Third image is taken after 3 weeks in care, the birds are now feeding them selves and are ready for release. Thank you Joe for your fast action, these chicks would not have survived for long on their own. 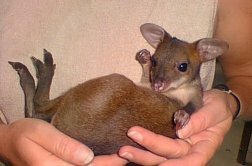 This little Red neck Pademelon was found by Dean on a country road, Dean and his family stopped when they saw this tiny joey hopping around her dead mothers body, Mum had been killed by a car we assume. Dean was able to catch the joey, and called WIRES. The joey seemed unharmed, and indeed for 10 days she seemed to do well in care. Unfortunately as sometimes happen, she went down very suddenly, she was rushed to the vet , but she died shortly after, due to brain injury sustained earlier in the initial accident. It can sometimes be heart breaking to care for these animals, specially when there is no prior warning to something like this. However this little joey was well fed, warm and secure for the time she survived after her mum was killed. Thank you Dean for taking the time to stop, and calling WIRES. Storms can create a big problem for our naive animals, how many of us wo uld consider a nest of tiny birds after a rain storm. Lynda and Nicholas had been watching with interest a nest of tiny Lewins Honey eaters, the first image here is taken by Lynda and Nicholas just before a storm went through Byron Bay. After the storm they went out to check on the little nest. To their horror the nest had filled with water, one little chick had disappeared, and although they searched were unable to find it. The second chick was cold and wet, not in a good condition at all. They dried and kept the chick warm till WIRES arrived. Whilst in care with WIRES carer Melanie,the little chick made friends with a same age Welcome Swallow in care. They are seen here waiting for a tasty bite to eat. Both chicks were successfully released after 3 weeks in care. Thank you Lynda and Nicholas for saving this little fellow. WIRES macropod carer Joeanne recieved this little Swamp wallaby in care after it was found by Brian. Brian found the joey alone with no mother anywhere to be seen. How she was orphaned we do not know, but she was only half the weight she should have been according to her development and age, as Joe stated " a little bag of bones"
She is doing well considering what she may have been through. We will keep you up to date as to how she progresses in care. Thank you Brian for calling WIRES, and giving this little orphan another chance at life. Grace as she was named has done well in care, she is spending her time outside in a nursery pen, interacting with a number of Swamp wallabies like herself, this is an important part of their development as they need to learn how to interact when released, they must have the social skills to survive in the wild. These skills can only be taught by other wallabies not us. WIRES reptile handler Rhianna went to the rescue of this Water Dragon found inside a house, or should i say rescue of house owner Saasha and her husband who thought it was much larger than it turned out to be. Water Dragons may look scary, but are totally harmless. They can however deliver a defensive bite. We would advise you not to touch, if you find a Dragon in trouble call WIRES or your nearest wildlife care organisation for help or advise. On Saturday evening, 5th March 2005, Kerry and her family were on their way back from Ballina to Lennox Head after they had bought their pizza. They were traveling in the 80km zone past East Ballina Lake, the evening was mild, it was on dark, and the window was wound down - when a duck flew into the car, past the children on the back seat, hitting the rear window of the station wagon from the inside, knocking herself out. Having arrived home in Lennox, Kerry rang WIRES and by the time the carer had arrived, the duck, a Pacific Black Duck, had regained consciousness. Feeling fine the next morning, she was released into the creek of her stomping ground, the Chikiba Reserve. Australia Day was a sad day for a little family of Ringtail possums living at Bangalow. The Ringtail mother had made her drey (nest) in a large palm behind the Bangalow Hotel, there was plenty of cover and shade for her young, somewhere she felt safe and secure. On Australia Day someone set fire to the palm, no one knows who or why, the result was however a very tragic one for this little family. After the fire brigade had been and put out the fire, the Ringtail mother was seen to run out from nearby bushes and throw herself into a pool of water left behind, she was caught by the hotel staff, a patron taking her home away for the noise and mayhem. The hotel staff contacted WIRES, and soon afterwards she was taken into care. She was immediately sedated due to extreme stress, having lost much fur and treated for burns to her feet, hands and tail. During examination of the possum the carer discovered that it was a lactating female, which meant that somewhere there were also at least 2 young possum babies in big trouble. Bangalow Hotel was contacted and asked if they could be on the lookout for the 2 babies. Later that evening, hotel staff called back that they had seen the 2 young Ringtail possums, and were keeping a vigil on their whereabouts, so WIRES went back to the hotel. Unfortunately we were only able to catch one baby, the other one escaped and disappeared into the dense undergrowth. WIRES received yet another call from the hotel staff at 3.30 am the following night; they had found and caught the second baby. Mother Possum was reunited with her young. Unfortunately, one baby died from her injuries, curled up with her mother arms, just hours after coming into care. Mother Ringtail died 2 days later from internal injuries, probably sustained when she leapt from the flames. The second baby survived in care for 4 days, she died due to internal injuries. WIRES Northern Rivers would like to thank the staff at The Bangalow Hotel for their fast action when first discovering the mother Ringtail, their compassion and persistent efforts in their search for the missing Ringtail babies. Thank you also to the gentleman that tried to help mother Ringtail before WIRES arrival. Yet another possum has been brought in to care from Byron Bay. The Mountain Brushtail possum was found in the car park of a local backpackers, he is a well known resident even has a girlfriend so we are told, his name is Peter and his girlfriends name is Polly. How he was injured we do not know, possibly hit by a car, he was sent to Byron Bay veterinary clinic where he was examined no broken bones were found, and "Peter" was brought in to care. He is a very good patient, I am able to clean his wound, as long as he gets a banana for his trouble he sits very still munching away whilst he is attended to. He will stay in care untill his wound has healed enough for him to be in no danger from infection, as long as all goes well, he will be returned to the Backpackers where he has spent his growing years. Mountain Brushtail possums live for up to 17 years, we hope he will have many more years ahead of him. "Peter" has gone home to the Backpackers at Byron Bay, his wound has healed and he is once again amongst his friends. Seen here a week before his release. Security guards are keeping an eye on Peter, making sure he continues healing. He still has to grow fur on the trouble spot, but keeping him in care for longer would have compromised his release, Peter is a very lucky possum as he has security able to keep an eye on him. Thank you to Craig for not only rescuing, but your continued concern for Peter. 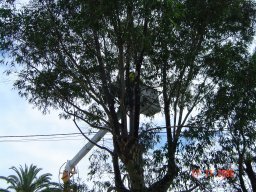 From Byron Bay area WIRES NR recieved 3calls for possum rescues, one after the other. One had a happy ending, the other two unfortunately did not. The first call was from a motorist in the middle of Byron, he had watched a tiny Ringtail possum make it through the traffic, narrowly missing 2 cars, our caller stopped, and as he got out of the car the little possum ran up his leg.This is most unusual, possums will try to get away, but in this case I think the possum was so frightened it would have run up anything to escape the traffic. It was brought in to care with WIRES, unfortunately it was too late for this little female, she had most likely been alone for some time from the state of her, and we were unable to save her even though all effort to do so was made. The second call came in shortly after the first, also from Byron Bay, this time backpackers had found a very small Ringtail possum in the early hours of the morning. Ringtail jo ey's are so sweet looking it can be hard to part with them, and not knowing too much about native animals, can also be a problem, so this little 64 gram possum went backpacking the next day. That evening WIRES was called, and the tiny joey came in to care. All effort to re hydrate the tiny possum was in vain, and she died shortly after coming in to care. Such a small animal can not sustain life for long with no fluid. The third call did have a happy ending, it was very much needed after the other two. This possum was a Mountain Brushtail joey, found in a shed at Billinudgel. When it came in to care, it became apparent that it had not been alone for long, only weighing 220gram, it would have dehydrated fast, but there was no apparent signs of being abandoned for long. I asked the caller of the circumstances in which he had found the possum, and came to the conclusion that it may simply have fallen off mums back. In the rafters of the shed were wool bales, and outside a mango tree, possum heaven.. I asked the caller to check for Mum when he came home, but he was not able to locate her. The possum joey stayed in care and the next morning the caller rang back, Mum was back in the rafters between the wool bales. The little possum joey was taken home, and as the caller recounted, what an emotional sight to see Mum and joey reunited. It is rare we are able to reunite joey's like this, usually Mum has been injured or is not able to be found, but in this case it certainly made the last few days seem more optimistic. Thank you Timothy for your effort in the rescue and return of this tiny Mountain Brushtail possum.